Freixenet Ice is the kind of sparkling wine that can be enjoyed easily with it’s intensely fruity finish, served over ice with mint and fresh fruit. It’s the sort I’ll pop open when I have the girls round for a catch up or at picnics and dinner parties. It’s been one of my go to bubbly’s this summer since attending the launch a few weeks ago. Perfect for hosting – Serve with ice and fresh fruits and you have a sparkly cocktail that is delicious and fuss free! I did it the other day and my friends were super impressed. One that everyone can enjoy (over 18 of-course) – Prosecco is usually known for it’s subtle taste and dry finish – this however, is fruity and sweet with a refreshing finish. Price friendly – For the quality of cava that it is, it’s incredibly price friendly around £8 a bottle – available in most UK supermarkets. It’s a summer drink all round – Fruity, light, crisp and good enough to get you in that summer feeling. Perfect addition to cocktails – If you’re all about experimenting when it get’s to cocktails like me, then this may just be the perfect addition! I’m thinking pimms or even Bellini.. but we’ll see! What’s your perfect summer drink? I love starting my mornings with a warm cup of lemon and ginger so it was a no brainer to combine the two with one of my faves.. green tea! They work like a dream together and i’m so happy with the way it came out. Crush the ginger with the back of a spoon or in a pestle and mortar. Then add to a mug and pour hot water, let it brew for a 10-15 minutes until the water is infused before adding to the lemonade. Make sure to drain the ginger tea through a sieve before hand to avoid any ginger bits in the lemonade. Place the ice cubes in a jug, you may need a handful or more. Then pour the lemon juice, green tea and brewed ginger tea, honey and mix well, you may want to tweak it to your liking, need a little sweetness? add more honey need a little more tartness, add more lemon juice or green tea for that . All in all I hope you like! How I plan on getting my summer body? Detoxing! and exercising ofcourse! but honestly this is the secret to a flatter tummy! (I’ve done it before so i’m doing it again) haha! and speaking of detox It feels like it was just yesterday when I did my first D.I.Y Detox recipes! Using those recipes in my daily routine especially the flavoured water, changed my habits for the good and had my skin feeling more hydrated and clearer. But moving onto things I needed something to get me in gear, especially as summer is lurking round the corner! So that means a flatter stomach and more energy to get through the day and most importantly my workouts. So here it is… The Teami blends skinny detox and colon cleanse (as pictured below) and not to forget the cute yellow tea infuser..
What does it involve? Some special herbs (they have a range of teas from, energy to relax and even pro-fit but I opted for skinny and colon cleanse instead). And Like any normal tea you’ll need hot water (or honey for taste if you wish). The Skinny tea (as pictured above & below) costs $29.99 which is £20 here in the UK. It’s a loose tea so I do recommend getting a tea infuser, I got a yellow one (which costs $8.49/£5.65). I drink this every morning and all you need is a teaspoon so it’s looking to last for ages. So far it’s has helped a lot with my bloating, it’s also given me a bit more energy (which is needed especially for working out). Best of all I’ve lost a bit of weight within a week! and seen a difference with just drinking it on it’s own! ahhh! *ps more updates to come! The Colon cleanse as (pictured above) costs $24.49 which is £16.39 and is to be taken every other day. It’s the first one I tried of the two and saying it helps with bloating is an understatement, it’s amazing as it also helps a lot with the digestion process and getting rid of unwanted stuff. I opted for the two as I wanted one for every day and one I can take when I want a major cleanse (i think it works well that way.. in my head anyway)! But so far i’m loving it. The shipping was fast and most of all their price is very reasonable considering how well it works! *Ps* each tea bag should infuse for 3-5 minutes before drinking and visit their (website) (www.teamiblends.com) for more info. To kickstart January in a healthy form I’ve chosen my favourite detox drinks for weight loss and just general well being. Like most things each of the recipes below can be taken in moderation and part of a healthy balanced diet to see results. I, in particular like to take these in between meals (like my teas, detox water, cranberry juice) or first thing in the morning like smoothies which can also be used as snacks in between meals. Do be aware of any allergens that some of these ingredients may contain and consult a doctor if you do suffer from any before opting for one or more of the recipes below. If in doubt remember water is and always will be your best friend :). Below are a list of the ingredients & Benefits featured in the video. Berries & Orange Detox Water: Great replacement for fizzy & sugary drinks! -Blueberries (handful) < These bad boys are great anti-oxidants and are high in vitamin A & C.
Lemon & Ginger Detox Tea: AKA My Weight Loss drink! – Cayenne pepper (aka supper food ) I use this in a lot of my cooking. First off it is a digestive aid that stimulates the digestive tract, which increases the flow of enzyme production & gastric juices. it also helps for relieving intestinal gas (Good bye bloating) & aids the body’s ability to metabolize food (and toxins). 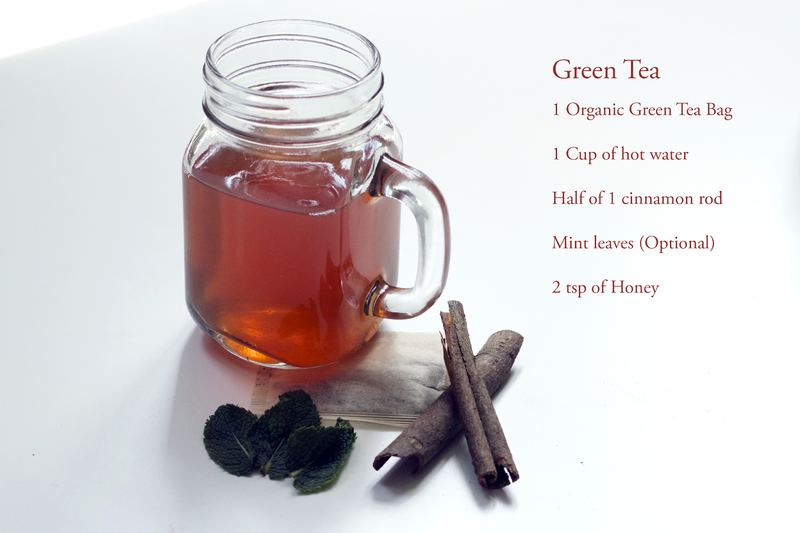 Cinnamon Green Tea: The simplest & if not best detox drink to get your hands on! Green Detox smoothie: For great skin and well being! Carrot Cleanse Smoothie: My go to smoothie for cleansing! Last but not least Cranberry Juice.This supper juice as I call it is rich in antioxidants & vitamin C. It is great for the bladder and does a good job flushing out toxins from the body. Whilst enjoying a cup of cinnamon green tea I thought it’ll be great to do a post on it alongside a few of my other favourite ‘detox’ teas. So I’ve picked my top 3 that I like to drink alternatively or every now and then. The great thing about these is that they are natural ingredients and come with lot of health benefits. This is a great remedy for colds or those days when I’m stuck in bed and need something to soothe my throat or help with my blocked nose. 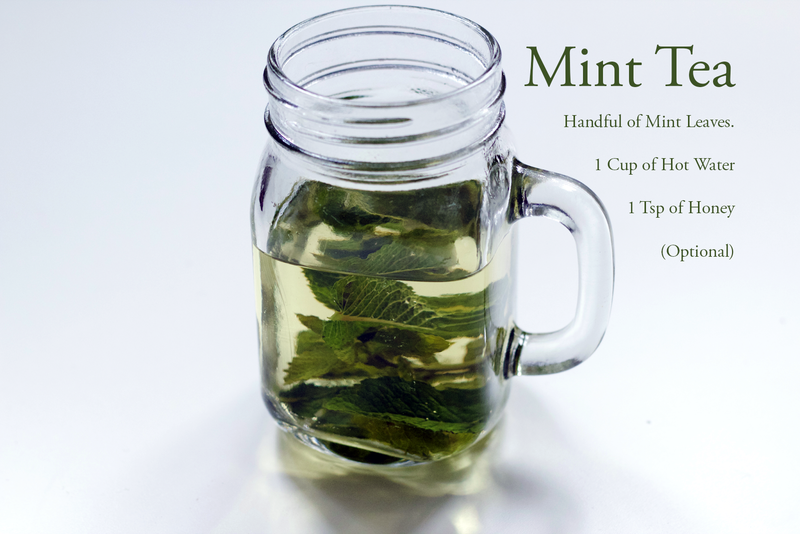 With just a handful of fresh peppermint leaves and a dash of honey(optional) you get a real soothing effect. The other great thing about this is that it’s caffeine free so it can enjoyed by anyone at anytime of the day. 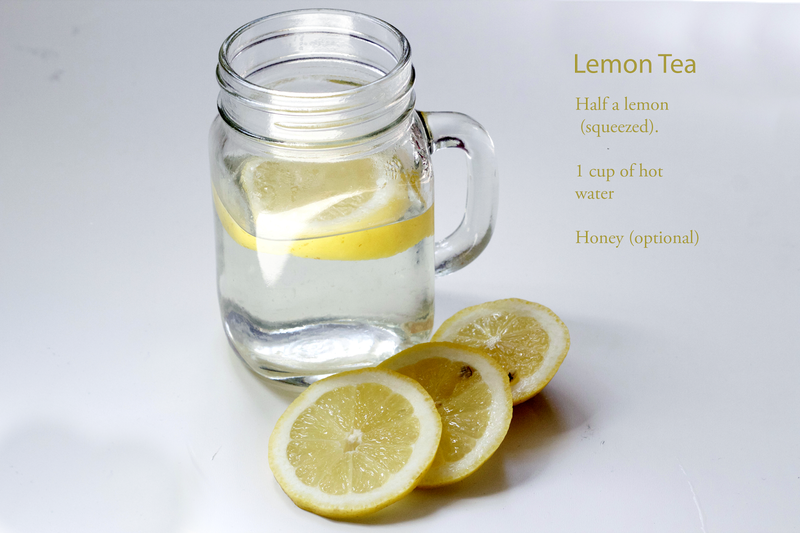 Simply 1/2 a lemon (squeezed) in hot water, this is great for boosting metabolism and helping with weight loss andd You’ve probably heard of this before but it really helps! I usually have a cup every morning but I do try to switch it up by having a slice of lemon with a glass of cold water or switching it to green tea. (As you know too much of anything can be bad for you and in this case it’s the citric acid from the lemon that can be bad for the lining of your stomach) so moderation is key. Nevertheless, you can sip and enjoy all it’s health benefits at once. You can grate some fresh ginger for an extra kick, honey may be optional too. Finally the drink that started it all !! my honey, cinnamon (rod) green tea. As much as I love plain green tea I couldn’t help but spice it up a bit, I LOVE cinnamon so I decided to mix the two together with honey and boii do they make a great combo. If you’ve never tried this before do! Cinnamon itself comes with a few health benefits so add for additional flavour. *I prefer organic to normal green tea for many obvious reasons, it’s taste better and I think there is a significant difference in the taste, especially if it’s drunk on it’s own without any additional ingredients. More so it’s left in it’s natural state without any additives so you get the full benefit of what it has to offer so opt for organic! When I want a cocktail that is refreshing and fuss free, sangria springs to mind. The thing I love most about this recipe is that it’s simple and full of flavour only requiring a few minutes to make, with a few simple ingredients. 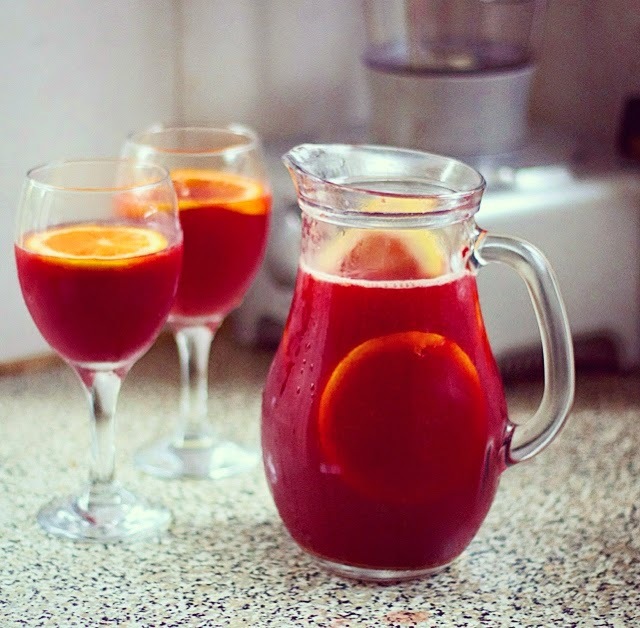 From the spanish provenance, traditional sangria is a combination of red wine, brandy, juice and chopped fruits. I call it the Red wine punch as it’s fruity, spicy and just too good! I like mine sweet enough not to taste the alcohol, so go easy when using this recipe cos’ after a few glasses one might feel a little light headed ;). 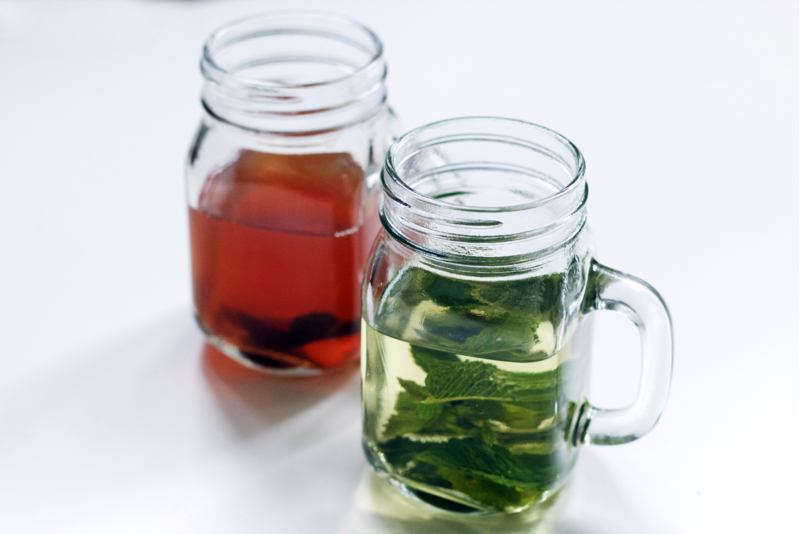 I’ve put together my version by playing around with the ingredients, I’ve used cinnamon, mint and zesty fruits for full freshness and fizzy drinks and sweeteners for extra flavour. Time: 4 minutes (For best results make sure the drinks are chilled, even the wine if you wish). 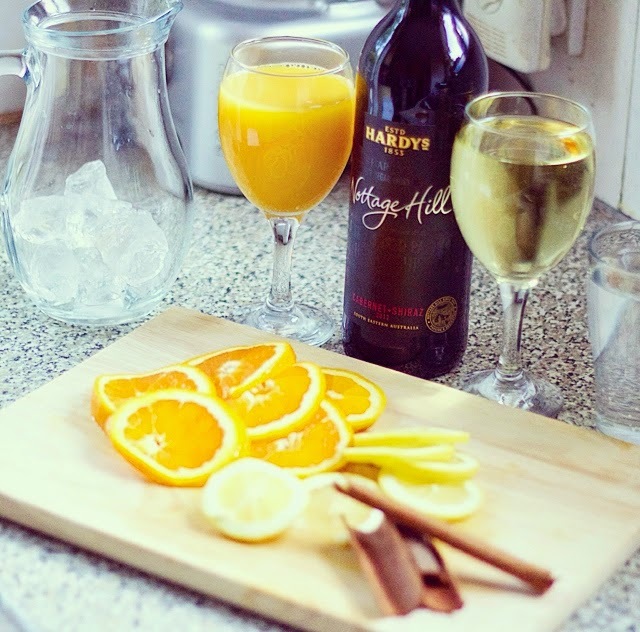 * I Find it easier to measure the drinks with a wine glass saves time and offers a good balance of flavour. In a jug, add a handful of ice. Slice a large orange, followed by 1 lemon and add to the ice. pour half a bottle of red wine over the ice and sliced fruit. Then 1 1/2 wine glass of Sweet white wine (Moscato). Stir with a spoon and mixing well together, pop in the fridge for an hour.